Buyers shut down to save energy as the week ended, but not before they’d muscled past a supply zone created in mid-December on the way down (see inset). Expect them to return in force once the news environment turns favorable again toward a wafting rally. 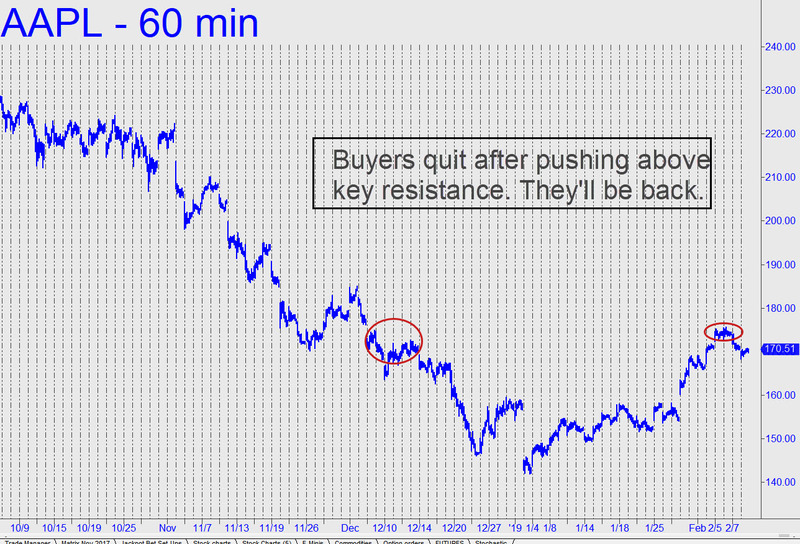 AAPL is being deftly manipulated higher on short-covering, but the news cycle is crucial to the effort. Under the circumstances, we might expect AAPL and the broad averages to go nowhere on Monday, usually a non-news day; then to start rising again when some pseudo-‘real’ news begins to dribble out on Tuesday. AAPL has the potential to hit 178.00 on the next burst, but it will need to push above the 184.94 peak recorded on December 3 to fool the herd into thinking new all-time highs are actually possible. _______ UPDATE (Feb 13, 5:13 p.m.): AAPL feels leaden, the moreso because the dirtballs who manipulate it for a living opened it on the high of the day, making fools of buyers. They will remember this, at least for a short while, adding an extra layer of supply the next time DaBoyz attempt to goose the stock._______ UPDATE (Feb 14, 5:34): Zzzzzzz. AAPL went nowhere — including down, which I read as slightly bullish. _______ UPDATE (Feb 25, 6.09 p.m.): The stock’s canny handlers gapped it past the 173.24 midpoint pivot of the pattern projecting to 178.06, making a run-up to that number practically a sure thing.